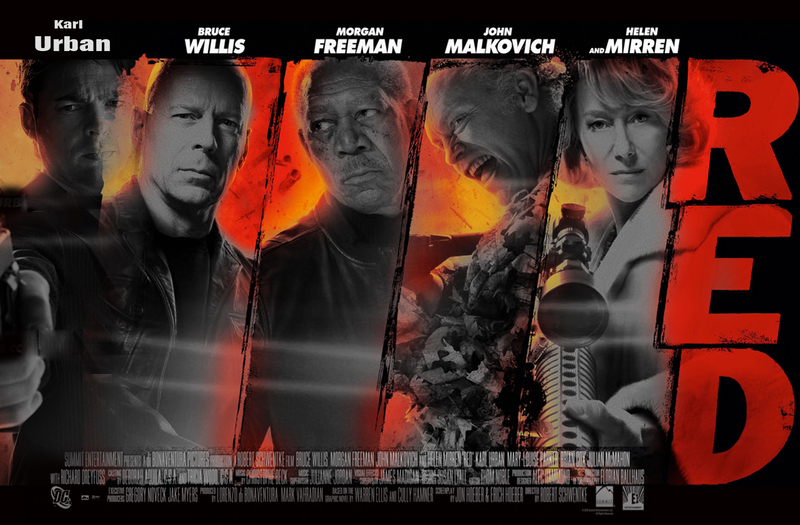 Caught the 2010 movie RED starring Bruce Willis, Mary-Louise Parker, Morgan Freeman, Karl Urban, Helen Mirren, and a hilarious John Malkovich. More proof that stars of yesterday are aging because now they are playing characters who have to deal with the drudgery of retirement. Tough enough for folks that live regular, 9 to 5, jobs. An anathema for those that worked for the military and/or intelligence agencies. Bruce Willis plays the straight man to a cast of eccentric characters as a retired and deathly bored ex-CIA operative who strikes up a phone relationship with Sarah, his case worker, at the government pension processing center, by tearing up his pension checks as an excuse to keep calling her. Willis is marked for death because of something from his past and he gets the band back together to find out whom is behind it. The twist is that his ‘band’ are also all retired and bored with it. Pretty standard stuff so far. The twist is that they are all classified as RED – Retired and Extremely Dangerous. John Malkovich shines as the ‘MadDog Murdoch’ of the bunch having been tortured one too many and hence his grasp on reality is tenuous at best. This is a fun cast that plays the age aspects of the movie conceit to the hilt along with new fast rising star Karl Urban – as the young gun hired to track and eliminate Willis. BTW, Urban has just signed on to take the lead in the new JJ Abrams/Joel Wyman upcoming SF/Cop buddy drama which pairs Urban with an android partner. My interest is certainly piqued given Urban’s work with LOTR, Dredd, and of course, as Bones in the Star Trek reboot.